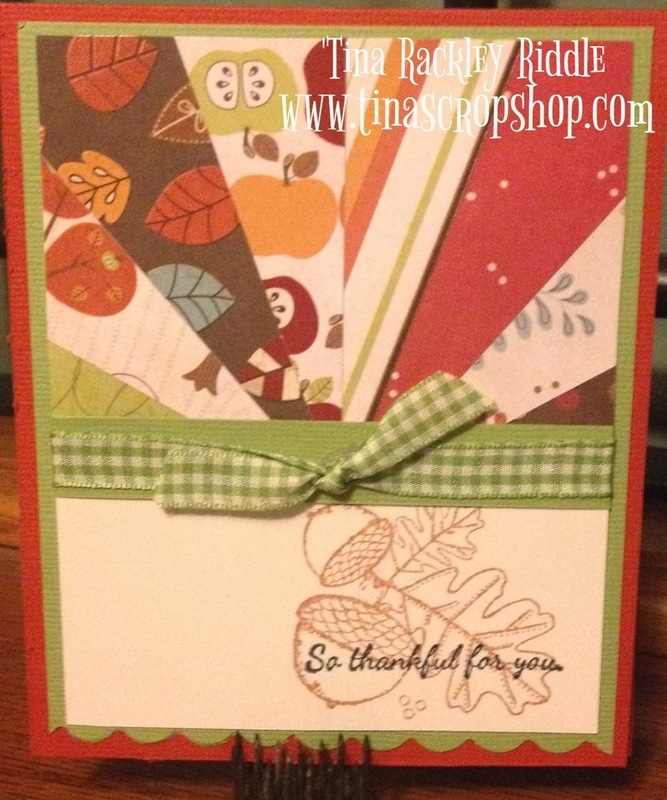 Tina's Crop Shop: OSAT Blog Hop - Throwback Thursday! OSAT Blog Hop - Throwback Thursday! Ok, so enough big hair and back to the matter at hand.. Throwback Thursday! I believe this may mean different things to different crafters but for me I thought I'd share one of my very first blog cards with you and show you how I've recreated the same type of card with new products. My original card was from October 2013. Before I get to my card I thought I'd tell you a bit about how it all started. I started scrapbooking around 2003 when my son began playing football. Later he joined the Marines and I scrapped all of his years of duty at various places around the world. He still treasures those books and loves to look through them. In 2008 I remarried and moved to Manchester, TN and continued my love of scrapbooking. After moving here I met my sweet friend Polly and she invited me to her house to scrap. From that point on I was at her house on Friday nights to scrap or craft. I can still remember going over there and seeing a huge box of stamps and asking her what she did with them. I started off by stamping things on my scrapbook pages. Then she showed me how to use chalk ink to ink the edges of my pages. Well that was my introduction to stamps and ink and wow has my addiction grown! Fast forward to 2013.. I met a sweet friend named Nicole Nastali in one of the Facebook Stamping Groups and she was certainly an encourager. I found out that she was a Stampin' Up! Demonstrator during one of our chats and I purchased quite a few additional supplies that I had been unable to find at local stores. She always complimented my cards and often talked with me about blogging. It was because of her that I started my blog. My first blog post was in 2013, the same year that I made the card pictured below. 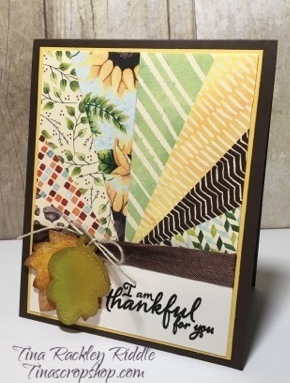 I picked this card for my Throwback Thursday project because it was my first attempt at finding a cardmarking tutorial and creating it with the stamps and patterned paper that I had. Here's my card using Unity Stamp Co. Acorn Greetings Stamp Set from 2013.. In my blog post from 2013 I explain how I made this card. For info on the Starburst or Sunburst Design from my original blog post click here. For my updated version with new products I decided to go first with a Christmas Design. Here's my Christmas Card using the new Stampin' Up! 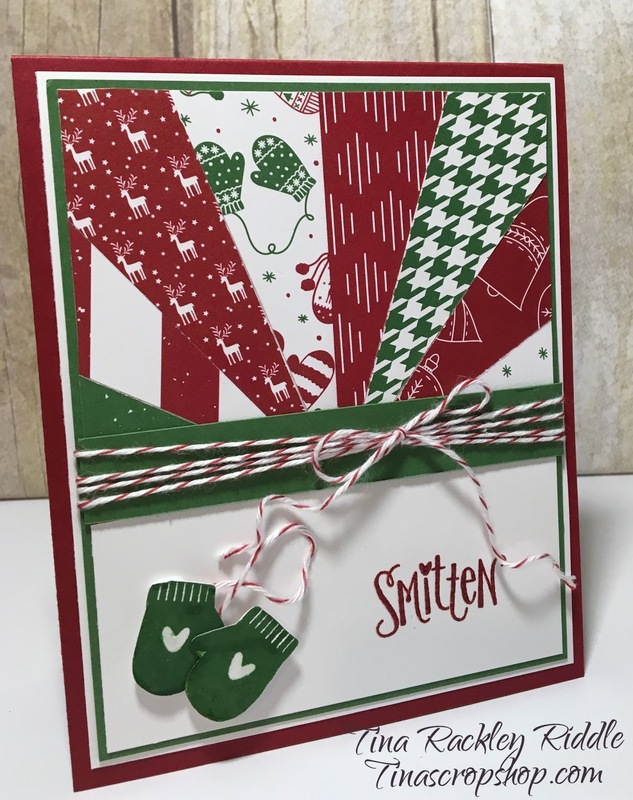 Stamp Set called Smitten Mittens. I decided to make the panel longer instead of using an edge punch to add to the panel on the bottom as I had done on my original card. I actually got my inspiration for this card from a Stampin' Up! DSP share that I bought from Linda Heller when the new annual catalog came out. 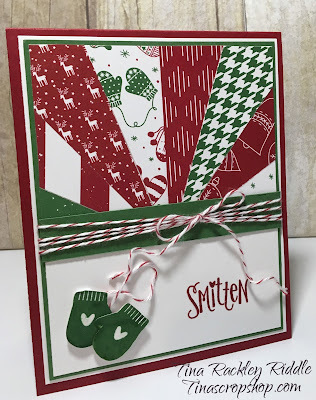 As I thumbed through the patterned paper I loved the designs as well as the colors of Cherry Cobbler, Whisper White, and Garden Green in the Be Merry DSP. I stamped the small Mittens in Garden Green and attached them with foam squares. The "Smitten" Sentiment was stamped first with Versamark and then SU Cherry Cobbler Ink using my Misti and clear embossed. I don't know how I survived without my Misti! My next card using this technique is a Fall Theme card using the Painted Harvest Stamp Set and the Wood Textures DSP Stack. I stamped the flower from the stamp set onto Very Vanila Cardstock first in SU Daffodil Delight and then in SU Crushed Curry Ink. The center was stamped in Soft Suede Ink. I added some Pretty Pink Posh 4mm Espresso sequins in the center of the flower as well as scattered around the card. Last but not least I made one additional Fall theme Card..
My last card uses the Painted Autumn Designer Series Paper. The sentiment if from the Painted Harvest Stamp Set as was the previous fall theme card. I thought adding a Sunflower to this one would be too much so I added two Stitched Leaves from Fall Tiny Tags set by Lawn Fawn. I ink blended some distress inks in various fall colors onto Bristol Smooth Cardstock and then die cut the leaves. Once cut out I also sponged the edges and then tied them together and added some Natural Twine and attached them with Foam Squares. Thanks so much for stopping by! 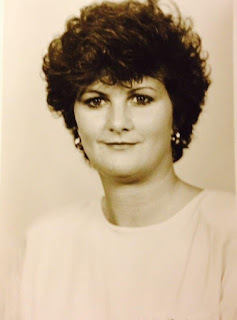 I'm sure you'll want to check out every blogger's Throwback Thursday post! Next up is Lori Mueller's blog. Just click the next button and you'll be there! Tina Rackley Riddle - That's me! Awesome cards Tina. I am definitely going to be casing them. Wow! Drop dead gorgeous throw back pic Tina! 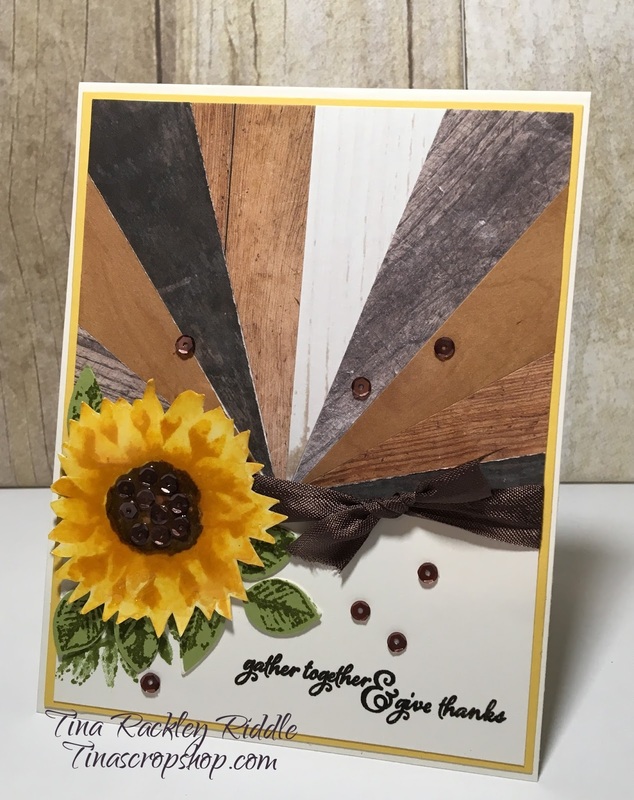 I have never tried the Sunburst technique-love your cards. Thanks for sharing your original post with tutorial so I can go back and check it out. Super work, Tina! Thanks for sharing. Visit Tina's profile on Pinterest. A Paper Pumpkin Thing Blog Hop - A Sara Thing Kit!